The best works of art take established forms and, like catching lightning in a bottle, magically transcend them. 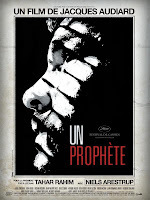 Un Prophete is such a work: a gritty crime-drama that out-Scorseses Scorsese himself, without falling prey to any of the American auteur's bombastic indulgences. This is a motion picture that richly deserves its Best Foreign Film Oscar nomination. Director Jacques Audiard has crafted an amazing movie, telling the story of a young man's progress through the ranks of criminality as he serves out a sentence for assaulting a police officer. We meet Malik as he enters the prison for the first time, and it's clear he's a wide-eyed nobody, more a danger to himself than to anyone else. Within moments, the denizens of the prison have sized him up and decided what to do with him. This is what makes Un Prophete a worthwhile story: it's more than a prison picture. It's the story of how a young man, trapped by circumstance and his own ignorance, gradually becomes an agent of his own fate. While we may -- and indeed we must -- disagree with some of the choices Malik makes, we must also applaud his developing ability to make them. Un Prophete is a masterpiece of economy, not wasting a single second of its over-2-hour run-time, and Audiard crowds the screen with telling detail and pitch-perfect performances. Absent are the expositional stretches of dialog or voice-over that are used to cover up the gaps in lesser works. Even when the emotional drama is at its peak, one never gets a sense of actors engaging in histrionics. This is realism that is all-too-real. In fact, Malik's first assignment for the gangster who eventually becomes his tutor is palpably disturbing (and, in a way that smacks of genius, actually resonates throughout the entire movie). In press articles about this movie, I have read that the director found his lead actor after they shared a car-ride, and, I must say, Audiard's choice of Tahar Rahim is inspired. Rahim inhabits the character of Malik so authentically and with such subtlety that it's hard to believe the same actor played both the opening and closing scenes. The arc of Malik's transformation -- from patsy to confidant to beyond -- stretches so far and moves so fast that it's a testament to Tahar Rahim that he pulls it off. One of the dangers of the crime-drama genre is in romanticism -- in forgetting that crimes have real costs, that criminals are largely detestable, and that violence is rarely beautiful. Un Prophete steers clear of any trace of romanticism, and yet it remains entertaining. Director Jacques Audiard even manages to make Malik's dreams seem realistic. One of my favorite blink-and-you'll-miss-it moments comes when Malik has to deal with the airport screeners as he takes his first-ever plane ride. These bits of mastery are sprinkled throughout and are so rewarding that even when Audiard relies on stock tropes (such as a shot of Malik sleeping with a baby in his arms), I approved. I have to mention a pet peeve here. I generally detest dubbed movies, except for cheesy Asian martial-arts flicks. I would much rather read subtitles and preserve as much of the actor's original intonations and expressions as possible, especially since the best actors use more than words to communicate. Luckily, the version of Un Prophete that I watched was subtitled. See this movie. Sure, it's a prison picture, but, in the same way that The Godfather is a gangster flick, Un Prophete is so much more.